First, I would like to thank three people in the community who's contributions during construction have become invaluable. Alicia from Orlando ParkStop has consistently provided accurate and reliable inside information on the ride show scenes, theming, queue experience, and more over the past two years. Dan at Midway Mayhem was the first to offer video of the coaster testing along with frequent photo updates from the park. Last, but not least, is Bioreconstruct who provided monthly arial photo updates from around Orlando including the demolition of Dragon Challenge to the final installations of Hagrid's coaster. Obviously we will be discussing spoilers for this attraction so if you wish to go into this ride with little knowledge then bookmark this and come back after you ride it. Ride on Sirius Black's old motorbike as you help Hagrid prepare for his Care of Magical Creatures class. 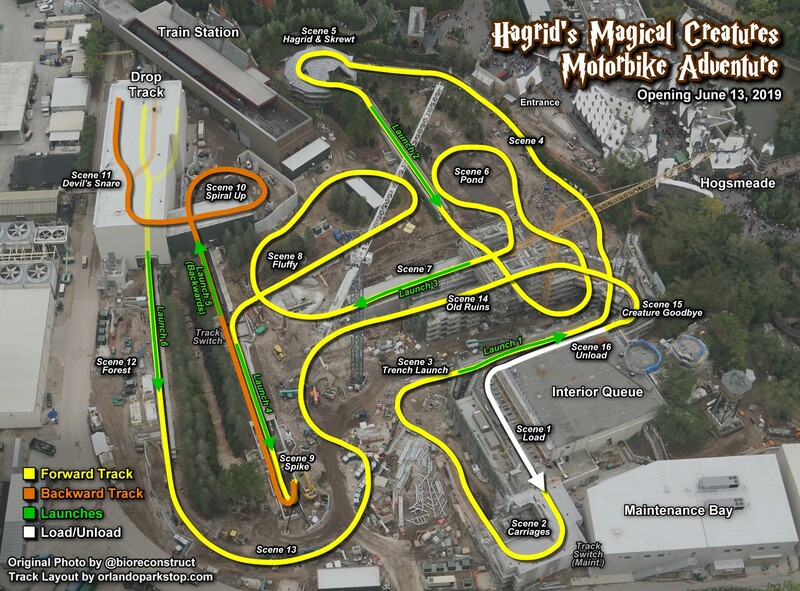 Hagrid's Motorbike Adventure will use the old entrance and exterior queue with some modifications. Guests will enter to the left of the Hogwarts Express train photo-op and ticketing building. After zig zagging through an exterior queue guests will approach a little used annex of Hogwarts for the interior queue. Little is known of the interior queue but based on rumors and passages from Order of the Phoenix it will likely be old classrooms and stables that have been repurposed by Hagrid for his teach of the Care of Magical Creatures class. Several insiders have suggested robotic figures (audio animatronics, AAs) and possible live actors could be in the queue. After winding through the massive interior queue guests will approach the load area where a line of magical bikes await to board for our adventure. Unlike Gringotts the coaster trains are expected to be continuously moving like The Haunted Mansion or Forbidden Journey. Those magical bikes aren't just any vehicle but are Sirius Black's bike that Hagrid uses to deliver (and remove) Harry from the Dursley's. The bike and side car will be attached with a solid platform and the sides open, allowing for easy boarding. The side car's seat will be about three inches lower than the the bike's seat, allowing for a slightly different ride experience. For those worrying about comfort the ride vehicles will feature traditional lap bar coaster restraints and not the lean forward restraints found on Tron at Shanghai Disneyland. Our journey starts by passing several stables that hold the Thestrals used to transport the students from the train station to Hogwarts. Guests will also see some of the Thestral carriages moving, implying some are still hitched. After a small dip guests will turn to the right and launch through a trench, tunnels under the abbey, and a small airtime hill before entering a hut to help Hagrid. In this scene we discover a blast-ended skrewt we will be helping Hagrid with. At this time a skrewt blasts the hut wall and escapes, starting our journey. A second launch occurs and we hit a pop of airtime as the coaster car swerves through the top of the abbey's structure. The motorbikes fly around outside the hut before regaining control and launching again towards the woods. After a slight stall and a check in with Fluffy. Our vehicles will then turn left and launch again before diving below a rock formation with the flying Ford Anglia perched on it. We then pull back up only to have our bike stall, sending us into a backwards free-fall, spiraling deeper and deeper into the forbidden forest. We're soon in pitch-black darkness inside the massive show building. 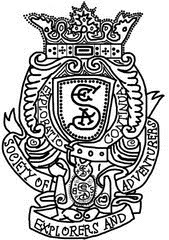 Inside we sense something moving and soon see we're trapped in a massive patch of devil's snare. The only way to get out is to hold very still, cast a bright light, or very hot fire will release the plant's grip. Of course once we're let go there's only one way to go: down. 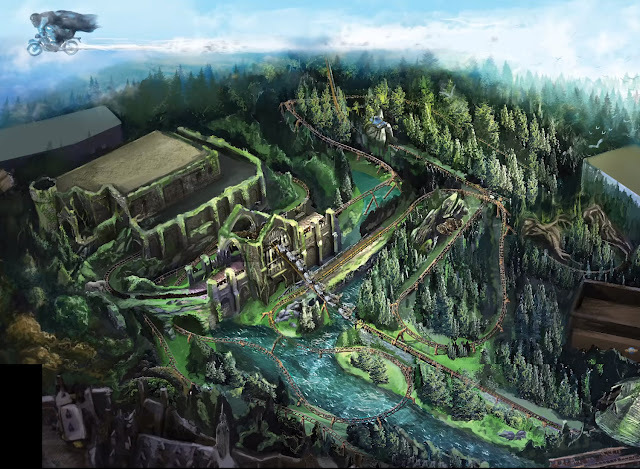 The ride will then have a vertical drop, similar to Tower of Terror, where our motorbikes drop out of the snare and we then again launch out and into an overbanked turn. As the ride finishes we pass a group of centaurs before landing in the middle portion of the abbey. As the motorbikes make their way towards unload we will pass a unicorn wishing us good luck and goodbye. 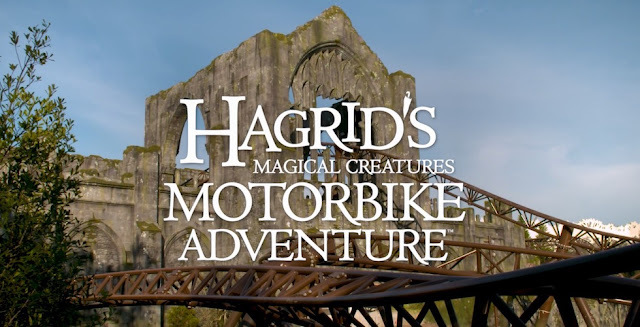 Hargrid's Magical Creatures Motorbike Adventure is sure to be a hit and possibly one of the best rides in Orlando once it opens. We look forward to riding this opening weekend and will cover it here on the blog and on our podcast.